Vendtrade is the largest second-hand vending machine company in the UK, but also sells and supplies new vending machines. With more than 600 vending machines in stock at any time, Vendtrade offers nationwide coverage and delivery. The company is also one of the largest buyers of vending machines, offering a ‘trade in’ service for clients looking to upgrade to newer models. 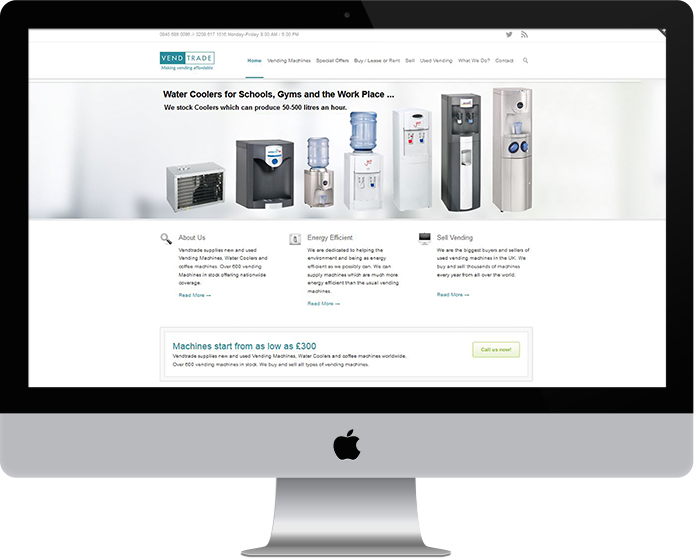 Our brief was to design and build a large site, containing a wide range of content that covered the product range and all the services Vendtrade offers. Search engine optimisation (SEO) was a vital part of this project. The client wanted the Vendtrade website to be on page 1 of Google results for many search terms. Because this was a large brief, we delivered a large website, containing more than 300 pages of high-quality content. This included products and services information, articles, link-building, forums and much more. We also used Adwords to increase immediate extra visitors and business. Because the Vendtrade website is a key part of the business, we have continually adapted and expanded it to keep up with the growing online business. This means as the project has progressed, our delivery has always adapted to capture different kinds of online traffic, and increase sales. While the resulting website is large, it’s easy to navigate and intuitive to use. Our focus on SEO has ensured that the Vendtrade website is on the first page of Google’s results for many key search terms.